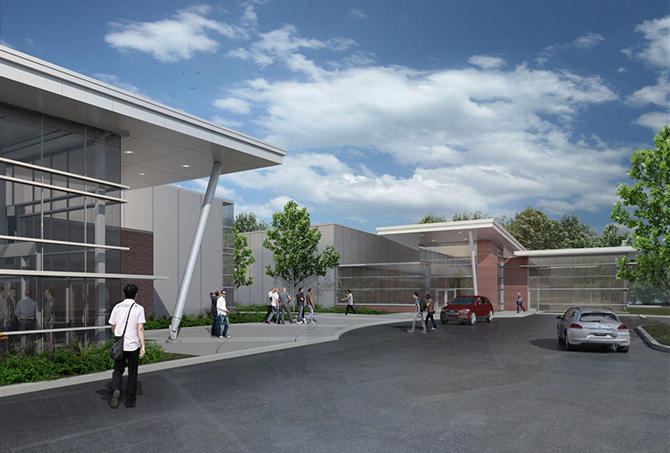 Quandel Construction Group was hired by the Pennsylvania Department of General Services as the general contractor for a new, 70,000 square foot Technology Center for Thaddeus Stevens College of Technology in Lancaster, PA. The $16 million project will include two separate buildings constructed on a former dump site, utilizing compaction grouting and micro-piles to accommodate the challenging sub-surface conditions. Although both buildings are single-story structures, the architectural design is very involved with multiple roof elevations, wing shaped roof structures, and an articulated façade with a combination of curtain wall, masonry, and metal panels. Once complete, the two buildings will provide a state-of-the-art educational facility with cutting edge audio-visual components and complex lab space to train students in technology programs. Construction began in August 2017 with the South building ready for occupancy in August 2018, and the North building ready for occupancy in December 2018.